Smart Cities are rapidly evolving into a sizeable market opportunity, and IDC's Worldwide Smart Cities Spending Guide offers increasingly granular insight into how cities around the world are transforming. This web conference will present the findings from the latest release of the Worldwide Smart Cities Spending Guide, which offers forecasts for 25 smart city use cases, as well as the overall market view, and a brand new view into City-level spending for 53 Cities across nine regions. We will discuss Smart Cities investments in the context of global trends in cities across regions, and how these trends are impacting spending on specific use cases, which are currently attracting the largest investments, or that are emerging as fastest-growth areas. The future of blockchain remains promising as enterprises move along their digital transformation journeys and look to blockchain to gain a competitive advantage. End users will realize the long-term value this new and innovative technology holds, building upon their existing technology infrastructure and also layering on new and emerging technology to create a complete ecosystem. In this webinar, we will share market insights on expectations about technology adoption from the field and key insights on the spending landscape for key blockchain use cases and trends. • How did the technology market perform in 2018, and how have forecasts for 2019-2022 changed as a result? • What impact will the US-China trade war and tariffs have on IT spending over the next 12 months, and and which other economic wild cards are starting to impact IT budgets? • Which new technologies are experiencing the fastest growth in emerging markets, and which geographies are set to emerge as global leaders beyond 2020? • How quickly are tech budgets moving from traditional IT deployments to the 3rd Platform of cloud, mobile and new technologies such as IoT and robotics? • What are the key vertical industry trends which are driving IT spending patterns and vendor revenues? In this IDC web conference, Stephen Minton will review the latest ICT spending data and leading economic indicators for ICT budget trends and new 3rd Platform technologies, alongside updated market sizing and forecasts from the IDC Worldwide Black Book, including analysis of economic scenarios related to the ongoing trade war/tariffs which are currently disrupting the short-term outlook. In this session, IDC will share insights into the IT spending patterns of some of the world’s largest companies. These firms are often among the first to embrace transformative, innovative technologies in an effort to delight customers and reinforce their position at the top of the pack. 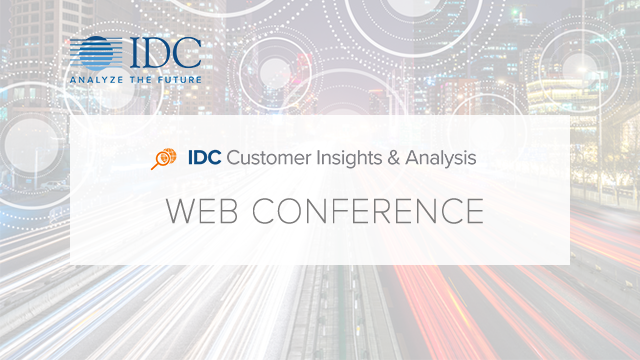 The web conference will showcase findings from IDC’s Worldwide Wallet IT research program, which estimates budgets and forecasts spending by region for more than 4,000 of the world’s largest enterprises. Join us for this webinar to see how IDC creates these data, and why the largest domestic and international IT vendors use IT wallet research to gather tactical data enabling more effective sales operations and marketing analytics. Love it or hate it, Digital Transformation is at the center of industry leading organizations. Digital Transformation is not simply a list of IT projects, it involves completely rethinking how an organization uses technology to pursue new revenue streams, products, services and business models. In this webinar we will share with you IDC's concept of building a business case around digital transformation, and the broader strategic priorities of organizations connected to digital transformation working together to deliver business objectives. We will share market insight into the regional and industry use cases driving investment in Digital Transformation, providing an in-depth view of the Digital Transformation spending outlook connected to business use cases. The worldwide SMB market continues to represent an important opportunity for providers of advanced technology products and services. Small and midsize businesses (firms with under 1000 employees) vary by company size and geography in their technology investment even as they pursue the shared goals of driving revenue growth and improving productivity. IDC’s SMB Spending Guide provides detailed SMB spending forecasts by 40 technology areas and 9 regions with additional detail across 54 countries. Join us for an update on 2017 spending and a discussion of the trends impacting the global SMB technology market in the years ahead. 3D printing solutions have moved well beyond prototyping to become prevalent within and across multiple industries. End users will realize the long-term value this innovative technology holds. Organizations continue to move beyond pilot deployments to realize the promise of 3D printing. To help vendors, capitalize on the opportunity, we will share market insights and data on the key 3D printing use cases and trends shaping the global landscape. This web conference will present the findings from the newly launched Worldwide Smart Cities Spending Guide in which 15 smart cities use cases were sized and forecasted by nine global regions. We will discuss the trends that are impacting investments, the highest areas of spending and growth, and differences between regions. Smart Cities investments will be discussed in the context of global trends in cities, and how these are impacting budget priorities and spending on specific use cases. This session will look at the drivers, trends, impacts, and overall market for non-traditional robotics on the modern digitally connected business. The evolution of technology in general has helped to drive the evolution of robots for non-traditional business applications. John Santagate, Research Director for Service Robotics at IDC, says “We are in a very interesting place relative to robotics. There has been a convergence of technology maturity and market acceptance that is helping to drive new robotic applications in business areas where robots have not typically been deployed”. Join us as we dig into what is driving the market, why this time it's different, and how the market will shake out over the coming several years. • How has the technology market performed so far in 2018, and how have forecasts for 2019-2022 changed as a result? • What impact will economic trends have on IT spending over the next 5 years, and what are the main downside risks to the outlook? • What does the expansion of the ICT industry and the emergence of new categories mean for traditional tech vendors and buyers? The future of blockchain remains promising as enterprises move along their digital transformation journeys. End users will realize the long-term value this new and innovative technology holds, building upon their existing technology infrastructure and also layering on new and emerging technology to create a complete ecosystem. In order to help vendors capitalize on the opportunity, we will share market insights and data on the key blockchain use cases and trends. The Internet of Things marches relentlessly toward a ubiquitous future as it becomes the underpinning of many 3rd platform technologies. Organizations are beginning to move beyond pilot deployments to realize the promise of the IoT.. Along this journey, technology adoption and the investment horizon is moving fast and hindered only by the speed of business change. In this webinar, we will share market insights on expectations about technology adoption from the field, key insights on the spending landscape and IoT buyer sentiment.